Lennox Central Air Conditioners have efficiency ratings ranging from 13 to 26 SEER, among the highest ratings you will find on any central air conditioner. 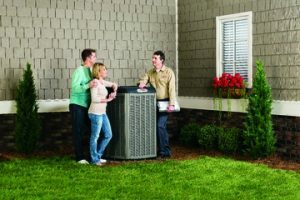 The most efficient Lennox Air Conditioning units gain their efficiency by using 2- stage, and variable capacity compressors which adjust according to weather conditions. Older air conditioners have one-stage compressors, so they’re either fully on or fully off, wasting energy and limiting the comfort level in your home . Two-stage Air Conditioners have two intensity levels that use different amounts of energy, but the best Lennox Air Conditioners have more than two stages and can adjust output in tiny increments, using only the minimum amount of energy required to maintain comfortable temperatures in your home. Among the quietest on the market, Lennox Air Conditioners produce as little as 59 decibels of sound as they run. Built from galvanized steel with a zinc-coated steel base, Lennox Air Conditioners stand up to even the harshest elements. One of many design features, the SmartHinge louver, makes it easy to access the the coils from every side, so maintenance easier. The Dave Lennox Signature Collection comes standard with 10 years warranty on parts, whereas the Elite and Merit Series air conditioners come with 5 years, which is upgraded to 10 years when registered with Lennox, within 60 days of installation.